The game also has a Party mode, in which you can play up to 4 people at the same time, it doesn´t have split screen, since the action is developed well in a single screen thing that will greatly appreciate. This section is very relative, because you can pass one level in 30 seconds, others can take 3 minutes or more, so this perception varies greatly. In total, the game can give us fun for 5-6 hours depending on each person and playing at all levels in both story mode and party mode. If we play the party mode and we are only two people we can play it and each one manages two robots. If it´s true that the first 10 levels are a bit like a tutorial, so the learning curve is perfect, you start very weak with levels that you can spend in less than a minute and then you reach levels that can take you 5,10,15 minutes. In the majority of cases, there is only one way to solve the puzzles, so if we try any other madness we will die trying. 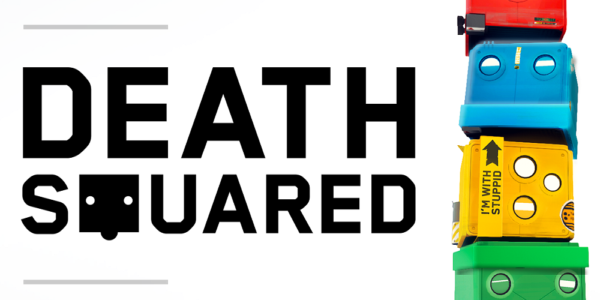 Death Square features a story mode, spread over 80 levels and a Party mode with 40 extra levels for up to 4 players. The first thing we have to do is place ourselves on the level and see where is the point where our robots have to reach, these points have the color of our robot. In the case of playing alone or cooperative are red or blue. Then at each level we have to move our robots in different ways to fulfill different orders, some red buttons to activate them, activate traps or mechanisms, so be aware of all this. This is a trial-and-error game, as you die you are learning the next moves so do not worry too much about dying. In addition there is an achievement to die 100 times, let yourself go. 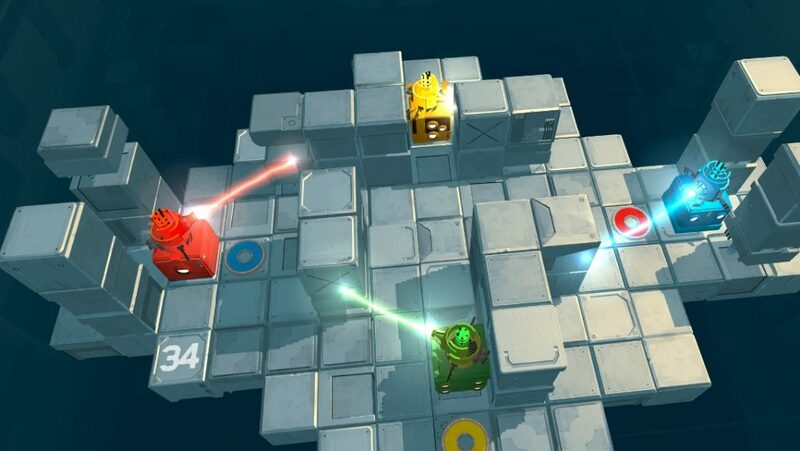 When the two robots reach both colored dots, the level will end. The loading times are quite fast, so in a few seconds we will be playing at one level and another, it´s a very fun game and it doesnt´ decay, as we go through levels are becoming more difficult and we have to use all our intelligence to overcome them. The game visually is very minimalist, as the action is developed on some levels with an empty background and a small structure that acts as a board where all puzzles are executed, which logically change as we go through levels. The most remarkable thing that we will find, are the colorful robots, buttons and cubes of colors for which we have to move. Death Square doesn´t suffer from any type of slowdown or some annoying graphic problem, with a visual section so modest we couldn´t expect anything else, honestly. 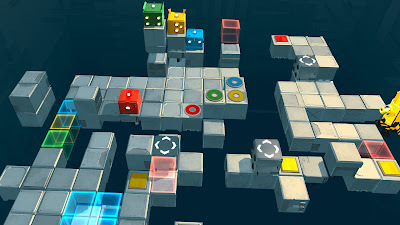 What has caught our attention is that during the levels the background music that softens the games is very repetitive. We recommend the game especially, if we can play it in company, since it doesn´t have online multiplayer, only in local. So it would be perfect for example to play it father and son, friends, cousins ,​etc. What is certain, is that the duration to be so many levels is not very high and we can finish it in 2 or 3 evenings. For the achievement hunters is the perfect game, they have an achievement by doing almost anything, especially at the beginning of the game. It would have been a perfect game, if we had more flashy graphics, a levels editor, more traps and enemies. But it stays in a correct game, although that if a lot of fun and is a pity since the game hooks and has a good curve of difficulty.